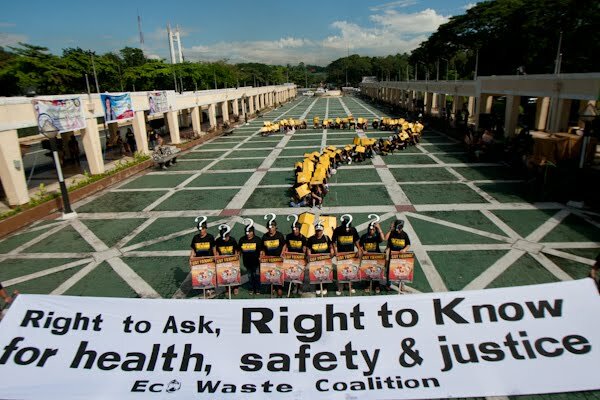 “Our rights for social and legal recognition as respectable workers is trodden on the ground as the Filipino people’s money goes to the pockets of the few instead of being used to advance our long overdue socio-legal rights,” Louie Lizano, President of the Nagkakaisang Mananambakan ng Dumpsite Area and member of the EcoWaste Coalition, exclaimed in the native tongue during this day’s waste picker gathering at the Philippine Rural Reconstruction Movement Building in Quezon City. The EcoWaste Coalition-organized event that pulled together some 50 waste pickers and representatives from different support organizations from various sites in Luzon saw the crafting of the participant waste pickers’ common agenda that will advance their general welfare and allow them to achieve their dreams and aspirations of a better living condition and sustained livelihood, on the way to their rise above poverty and a better future for their children. “Zero waste workers remain poorest of the poor, while the Filipino people’s money makes richer the already rich few,” added Eileen Sison, campaigner for zero waste and waste picker rights. “The corrupted money could have been rightly used to advance the waste pickers’ right to social protection benefits, such as the SSS and PhilHealth; guarantee their occupational health and safety; and allow their rightful integration into the formal solid waste management (SWM) system, providing them a safe, clean, decent and secured profession with wastes,” Sison further said. “The challenges concerning the NSWMC Framework Plan lie in its efficient implementation in more than 42,000 barangays; its close monitoring that will ensure that this system is effectively enforced; and the education of key stakeholders, with this latter alone requiring an approximate minimum of PhP 84 million to be accomplished,” Rey Palacio, Project Coordinator for EcoWaste Coalition’s Informal Waste Sector Project, said. “While some waste pickers still opt to continue working with wastes but in a dignified manner, there are several others who prefer alternative livelihoods. The waste pickers look up to the government for the necessary financial support towards the crafting and implementation of appropriate, effective and sustainable programs and projects that will uplift the waste pickers’ living and working conditions,” Palacio added. For years, waste pickers in the country continue to toil under an apathetic state policy and fight for a dignified life and decent livelihood as they struggle for recognition and the improvement of their working conditions. Despite their positive economic, social and environmental impact to the communities they live in, the government has yet to institutionalize supportive and inclusive policies and regulations that will safeguard waste pickers’ rights and ensure occupational stability and social protection. The waste picker workshop allowed participants to share their stories of growth and development, as well as challenges being encountered as they make a living from wastes. Some of these challenges include secured access to waste; exposure to health risks and hazards due to the presence of toxic, hazardous and infectious wastes in various disposal facilities; and insufficient government support. To take on these challenges, the participants need to have stronger organizations that will pro-actively fight for their social inclusion and improved economic conditions. Similar waste picker events in the Visayas and Mindanao, participated in by some 110 individuals in total, from three waste picker areas in the Visayas and four in Mindanao, were held in July 2013 to discuss the common issues and concerns of the waste pickers and come up with action agenda for the advancement of their rights and general well-being.